We can offer full service facilities in our award winning Workshops, including MG Rover Test book, GDS and VDS Diagnostic’s equipment for problem diagnosing and rectification on your MG We can also offer full vehicle diagnostics using our new AUTEL diagnostic machine covering most makes of vehicle. We cater for the entire MG range from the earliest Classic to the modern day MG ZS, MG3, MG GS and MG6. We also service Austin Healeys, Jaguars etc. In fact we will service any make or model of vehicle. Please contact us for our latest competitive service pricing. Volkswagen Golf 2.0 Diesel - 2010 model £125.00 inc VAT - including fluids using Longlife oil. The prices quoted include VAT. 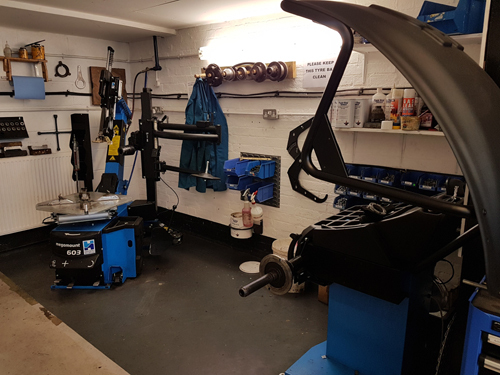 We offer a full MOT service on site at Brown and Gammons at a cost of £39.95 in our purpose built MOT Bay. The bay, is complete with all the latest ATL test equipment. You can View your car while it is having its MOT from the comfort of our reception area via 2 way CCTV viewing system shown on a widescreen TV. The Government’s latest legislation on MOTs does not require pre-1960 cars to have an MOT and it is now the owner’s responsibility to make sure the car is roadworthy. Lots of these cars are only used during the warmer summer months and so sit for months at a time (especially with our British weather). They are also lovingly worked on by their owners who gain pleasure from being able to work on these cars without all the modern wizardry needed for our modern cars. We believe that many owners of these cars will welcome the opportunity to have their cars go through a test similar to the MOT and with this in mind we can now offer a ‘Pre-1960 MOT Vehicle Check’ where we will test the car along the lines of the MOT test . Your cars Air conditioning system does far more than just keep you cool, when working properly it helps to filter out any pollutants and also pollen. It will also stop your windows misting up during the winter months. We at Brown and Gammons can offer a full air conditioning service for any vehicle please contact Neil on 01462 490049 for prices. Did you know that we can offer a complete tyre fitting service, while you wait at our Baldock premises. With the addition of our tyre fitting bay customers can take advantage of some of our exclusives on a wide range of tyres and after about 30 minutes they can drive away with the tyres that have been fitted and balanced in our award winning workshops, this includes balancing of wire wheels. Furthermore, if you fancy a new look for your car, why not opt for some new wheels to go with your new tyres. There is a wide range available for all models of MG, including the MGF, and we have put together some exclusive packages of wheels and tyres which make this an extremely viable option. With staff that can offer over 20 years’ experience in the tyre industry, why not contact us on 01462 490049 for a quote on fitting new tyres to your car today. If a car's wheels are miss-aligned it causes excessive wear on the tyres, particularly on the edges. This means that tyres have to be replaced more frequently resulting in increased running costs. Another symptom is that the Car will pull to the left or right and, under braking, could become seriously wayward. This means increased handling difficulties and lower safety driving conditions. 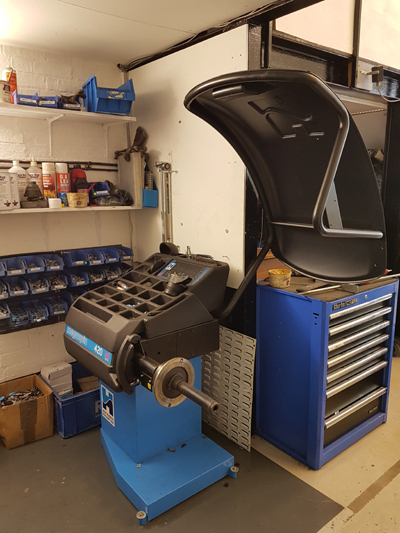 Our 4-wheel alignment equipment, the most advanced machine on the market, enables our engineers to check within one minute degree of accuracy how straight a car's wheels are. Each wheel is checked individually and if needed, adjusted so that all four wheels are perfectly positioned to enable the driver to derive maximum driving safety and pleasure. The process takes just 60 minutes and most models of MGs (cars) can be catered for, the only exception being the older, narrow wheel based cars like the T-Series MGs. 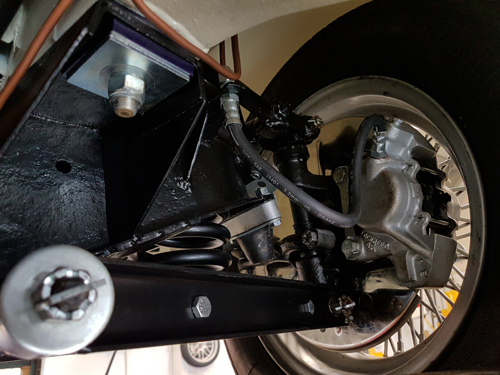 Customers who have already opted for this service are amazed at how even just a slight adjustment can make a big difference in how their car drives and handles. Some are absolutely staggered by just how much wear the edges their tyres have been subjected to. In fact, many customers are now including a 4-wheel alignment check in with their normal service as the slight increase in price could save them literally hundreds of pounds in reduced running costs." So, to save money and drive safely why not book an alignment check today. Contact Neil at Brown & Gammons Ltd on 01462 490049. Neil can also advise on all aspects of Brown & Gammons first class workshop services including serving, tuning, full & part restorations and competition preparation on all models of MG.
Over the past 40 years, we have restored hundreds of MGs from pre-war Triple Ms, through T-Types, MGAs, MGBs, MGCs, Midgets and V8s. 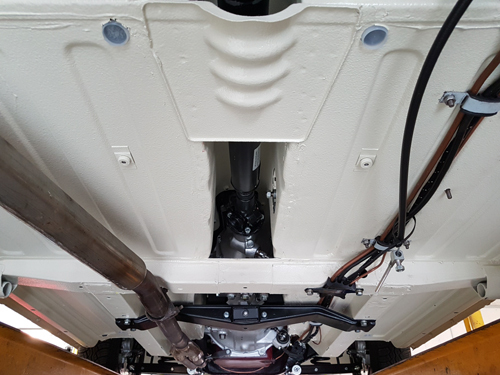 We've undertaken complete restorations or just done the bits of the job that you don't want to. 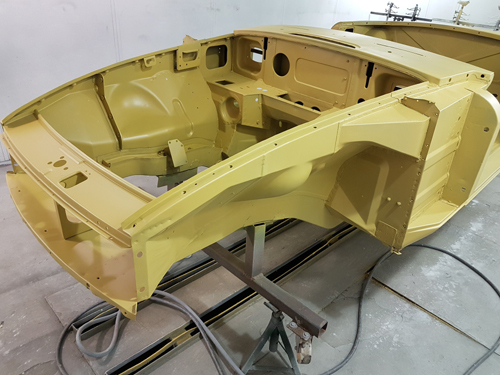 This can include body welding, paintwork, panelwork, mechanical work or interior trim. We've put cars back on the road to original specifications or uprated, modified and even improved either the cars mechanics or aesthetics. 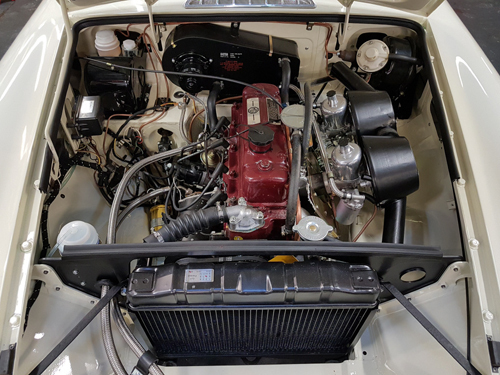 Throughout the work, we keep you abreast of developments (and there are normally quite a few) and we can take digital images of different stages of your restoration if required. 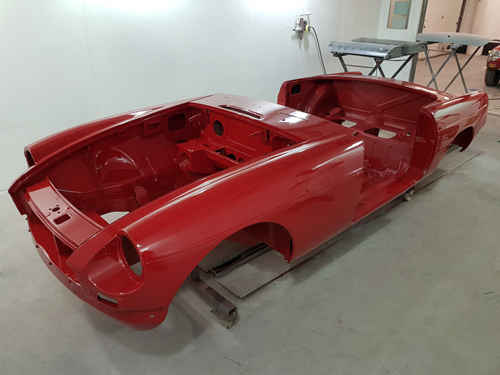 During the work, you are more than welcome to visit our premises to view the car and its progress and to chat about the work involved (just lets us know beforehand so that we can make sure there is someone available to talk to you). 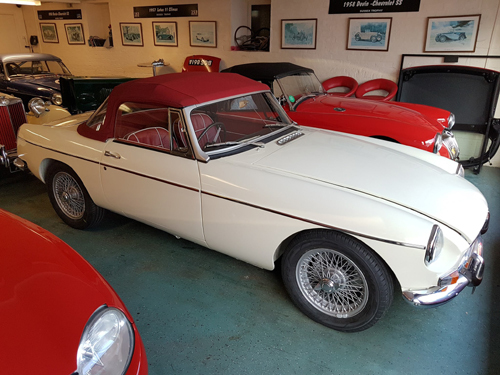 Brown & Gammons can boast a long and extensive connection with MG and classic motorsport both on the racetrack and in numerous historic rallies. Ron Gammons and his son, Malcolm, have both competed in many historic rallies, including Pirelli Classic Marathons, Classic Monte Carlo Challenges, Charringtons Historic rallies, Le Jogs and Leige-Rome-Leige. They have also contested countless race championships and invitation races, in both MGs and other classic marques like Austin Healey and Lotus. Ron has raced in F1 Grand Prix support races and competed at Goodwood both in the Festival of Speed and the Revival Meeting. Malcolm has ventured from MGBs to race an MGF both in road going Trophy format and the full on race-spec MGF Cup. If required, we can accommodate your car in our dry, secure storage facilities. The premises are properly alarmed and insurance is no problem. We can collect and deliver if required and our discretion is guaranteed.